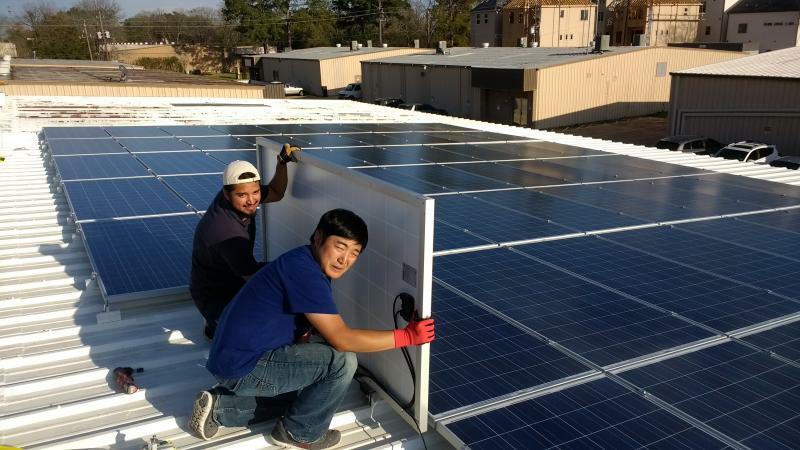 SRH Solar installs and operates solar PV facilities in Houston, Texas and surrounding areas. Our residential team designs and installs high-value facilities on home rooftops. The value proposition to the homeowner is clean, green power at a fixed price, over the 30+ year life of the facility. New solar PV qualifies for Federal tax credits, and can increase the value of your home. 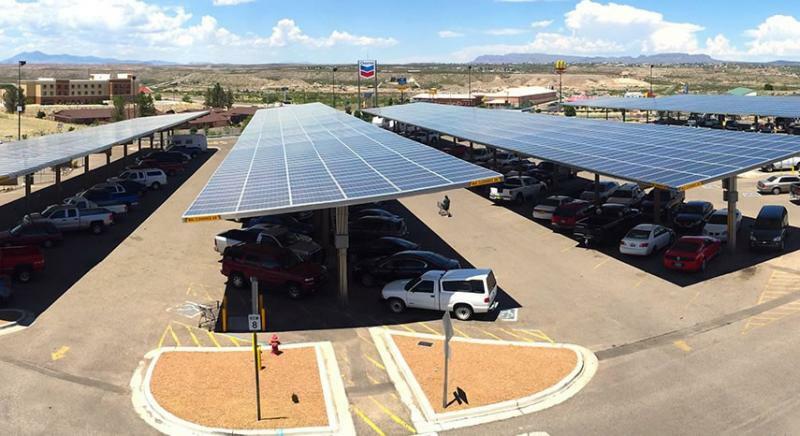 Our commercial team designs, builds and operates grid-connected solar PV covered parking facilities on parking lots and parking structures owned by commercial and government entities. The value proposition to the property owner is a “free” covered parking facility, paid for by the electricity generated. We can install on turn-key basis, or use a long-term power purchase agreement to reduce your upfront investment. Can my roof be used for a solar PV Project? The best roof faces south or southwest,with a pitch or slope of 10-45 degrees, few or no chimneys and a size that is at least 15' x 11' (this would allow a system sized at 6 panels, or about 1.5kW). A larger roof is better! Maximum electricity production in Houston is achieved by a roof facing due south pitched at 23 degrees. The roof should not be shaded from 9 AM to 6 PM. Partial shading reduces the production of electricity. You may need to trim or remove vegetation that shades the roof. How much electricity will my system generate? A system that has a nominal capacity of 10 kW, should produce about 40-50 kWhrs per day on average. Actual production will depend on the specific design and equipment used in the project, the direction and pitch of the roof, the amount of partial shading, and the cleanliness of the panels (bird dirt, leaf debris and dust will all reduce power production). Solar PV systems produce the most power on a cool, clear day. Solar PV production declines about 1% per year as the panels age in the sun. After 30 years, the system will still produce power, but it might be economically attractive to replace the older panels with newer, high-efficiency technology available then. Solar PV equipment is typically warranted by the manufacturer for 25 years (panels) or between 10-25 years (inverters). The cost will vary for a specific project design, so we would prefer to meet with you to get the specific details for your project, to give you a solid estimate. Generally, solar PV costs have been declining for many years. We install projects for $1.30 - $2.00 per nominal watt. So, a 10 kW system might cost between $13,000 and $20,000. Your net project cost is offset by the 30% Federal tax credit, depreciation (if purchased by a small business), and other local incentives which vary from time to time and jurisdiction. How long does it take to complete construction of the project? The initital design and consultation period with the homeowner may take several weeks as we jointly fine tune a project that is customized to your home and specific requirements. After signing the construction contract, SRH Solar normally completes a project in 6 weeks. Most of that time is taken in dealing with permitting and procurement. The actual construction usually takes about a week for residential sized projects. Which retail electricity provider should I use? It is important to select a retail electricity provider who pays for excess production (e.g. net metering). We like Green Mountain. Additionally, Reliant and TXU have retail buyback options. There may be new retail electricity providers who offer solar PV contracts. You can check them out on Powertochoose.org. What kind of covered parking facility will be installed? Our engineered parking structures are made of long-lasting galvanized steel with concrete footings, and solar PV panels and related electrical equipment as the canopy. The structures can use T-frame (see picture), L-frame or double leg columns for support, depending on site requirements. What kind of power will the facility produce? Our commercial-grade PV facilities produce 480V 3 phase power at the host site's current power grid connection (on the host's side of the utility meter). If necessary, we can produce 240V single phase power. Typical structures can produce from 25 (12 parking space) to 100 kW (48 parking spaces), depending on the size of the parking facility. We use a standard meter to measure how much power we deliver to your facility. A typical 60 kW facility would produce about 90-100,000 kWhrs annually, with power produced at peak HVAC demand periods in the afternoon. We size our facilities so that we produce less than the host site consumes, maximizing value. While excess production can often be sold back to the grid supplier, prices are typically not as attractive as the avoided cost for purchased power. What steps are needed to get started with a project? We and the host site owner first jointly select a specific site and a project scope (size of parking structure and electricity production). SRH Solar will then complete a feasibility study to ensure that the project parameters and economics are a “go.” Next, SRH Solar and the host site owner will complete a long-term power purchase agreement (PPA). SRH Solar will then complete the detailed design, obtain permits, construct the facility, and commission it. Once commissioned, the facility delivers clean, green power to the host's operation. Over the life of the PPA, SRH Solar will continue to maintain and repair the solar PV facility as needed to ensure efficient production of power. Who pays for the facility and its construction? SRH Solar pays for the costs associated with building the covered parking facility, the solar PV and electrical interconnections. We make this investment with the understanding that the site owner will purchase 100% of the power produced, at a rate comparable to their current electricity supplier, under a long-term contract. There is a Federal tax credit. Who receives that? The Federal tax credit is available to for-profit entities, and can be as much as 30% of the investment costs for qualifying solar PV facilities. SRH Solar retains this credit as a way to keep costs down and enable the investment. How does maintenance get done? Generally, solar PV parking installations don’t require much maintenance. Wind and rain tend to clean the solar PV without washing. The parking structure itself is galvanized steel, and does not require repainting. The solar PV panels are warranted for 25 years operation. Other electrical equipment is typically warranted for 10-25 year operation. SRH Solar will use its online data from the solar PV system to identify and schedule any required maintenance with the site. Oops. We crashed into the parking structure and it got damaged. Now what? The parking structure is well engineered and will resist minor bumps, but a major collision can cause damage. The power purchase agreement will lay out specific responsibilities for insurance coverage, loss of revenue and repairs. Our facility needs to expand into the space used by the parking structure. Now what? The power purchase agreement will provide for early termination payments, varying by duration. When these are activated, we can remove the solar PV parking structure, and wish you all the best for a successful expansion. 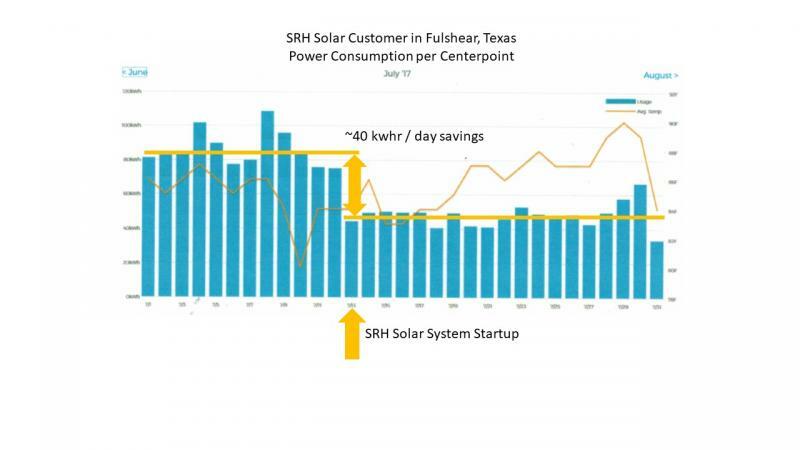 What happens if SRH Solar goes out of business? We would hate for that to happen, just sayin. Our parent company has been in business for more than 12 years. But, in that event, the power purchase agreement would provide appropriate terms to transfer the ownership of the solar PV facility to our successor company, or failing that, to the site owner/operator, and you can keep on producing clean, green power.